During the incubation of any egg (whether it be artificial or parent) if we get a chance to have a peek for fertility…. We will. The ‘Candle’ method has been a tried and tested method to see those tell-tale first growth signs of life at around day four of incubation, and there will always be a use for candling to show vein growth etc. However, it is quite possible in seeking to get a good picture of development that the breeder overstays his time of inspection and causes heat damage to the embryo. When all eggs reach the mid to latter stages in development (from about 12 days onwards), then we can see very little and start to wonder if our developing embryo is still going to make it. A well-tried method for checking for egg viability at this stage is to float it in warm water and wait to see if it moves! However, recent research has shown that this method also is detrimental to the embryo, as the egg becomes saturated with water, and becomes susceptible to harmful bacteria, which are sucked in through the pores of the shell. How many times have we all thought ‘is it still alive?’ Indeed, there have been many bird keepers who have mistakenly thought that ‘it must be dead, because it should have hatched yesterday’, so the top of the egg is removed, only to find the chick was still alive and is now well and truly dead. Disaster! Your troubles are over!!! 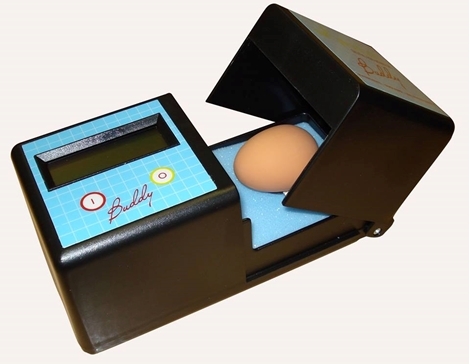 During the last 9 years and after a terrific amount of work and research we are pleased to announce the arrival of Buddy, the first and only digital egg monitor in the world that has been made available to those involved in egg incubation. There is no heat radiation whatsoever, so Buddy is completely safe. If your egg is fertile then Buddy will tell you by around day seven or eight. You simply place your egg in the egg compartment, close the lid and press the "on" button. You will instantly be given information from the onboard screen via a flashing heart, Pulse readout, and three-digit heart rate. (You will be amazed how rapid a chick’s heart beats)! If the chick is moving, then the Buddy egg monitor will tell you. When the chick settles the readout reverts back to heart rate. 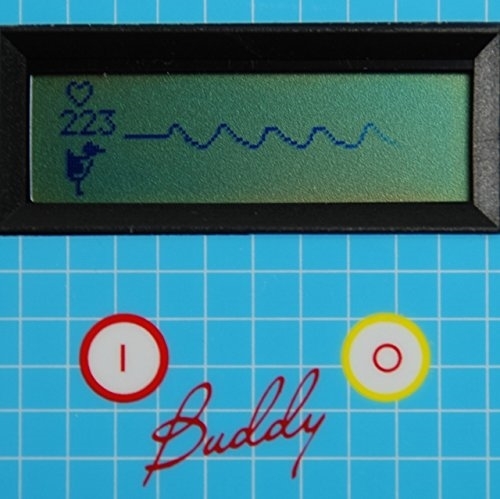 If the chick is not alive Buddy will let you know, showing a black still heart, a flat Pulse line and zero heart rate readout. Buddy is mains or battery operated so can be taken out to your aviary to check any eggs, or if your work is in the field of conservation you can take Buddy anywhere you go, even up the tallest of the Rainforest trees! You will wonder how you ever got by in the past without your Buddy ! !